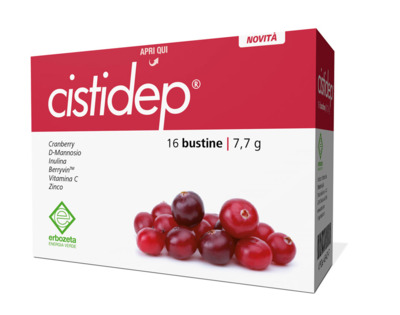 CISTIDEP® sachets is a dietary supplement based on Cranberry, D-Mannose, Inulin, BerryvinTM, Vitamin C and Zinc. Cranberry is useful for the function of the urinary tract. BerryvinTM provides 80 ORAC (Oxygen Radical Absorbance Capacity) units per sachet. Inulina,D- Mannosio, CystiCranTM (Cranberry), BerryvinTM (Frutti rossi), Vitamina C e Pido-Zinc® Zinco pidolato. Take one sachet a day, dissolved in a glass of water, preferably after meals.